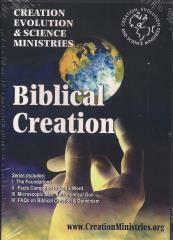 Russ Miller from Creation Evolution and Science Ministries does PowerPoint seminars, DVD Study series, Grand Canyon Bus Tours and more. He has presented hundreds of seminars nationwide, spoken on various college campuses, at “Steeling The Mind” conferences and appeared on TBN’s “Creation for the 21st Century” with Dr. Carl Baugh. Russ has also aired thousands of radio programs and CESM DVDs are challenging people worldwide to believe the Bible - Word for Word and cover to cover. Topics: Secular worldview vs. Biblical worldview. Historical revisionism. Genesis is under assault because it is the foundation. No death before Adam. Fingerprint of God upon the history of the USA. Great Awakening. Founded by over 90% Christians. Age of reason in 1700's in Europe. Images in House of Representatives (Moses). Laus Deo on Washington Monument. Moses in Supreme Court. Prayer removed from schools. Teaching of evolution. History is being rewritten. Frauds in the textbooks. Most people want to believe in biblical creation. Quotes from: Karl Marx, Frank Zindler, Johnathan Edwards, George Whitefield, Dr. Benjamin Rush, Patrick Henry, Benjamin Franklin, John Adams, Thomas Jefferson, James Madison, Timothy Dwight, Lyman Beecher, FDR, Dwight D. Eisenhower, John F. Kennedy, Noah Webster, Mao Tse-Tung, Roger Baldwin. Topics: Foundational issues. Moses wrote of Christ. Genesis 1 & 3 explain the need for the gospel. The flood formed the sedimentary layers full of fossils. If man evolved then the gospel is not true. Science is observable and repeatable. Historical science is not repeatable. The Law of Biogenesis. Irreducible complexity. Micro evolution vs Macro evolution (micro adaptations). Gene depletion (genetic entropy). Mutations. Natural selection. Recapitulation (ontogeny recapitulates phylogeny). Fakes of Haeckel's drawings. Humans DNA is 75% the same as a worm, 50% similar to a banana. Insecticide resistance. Archaeopteryx features similar to modern birds. Birds found in layers below Archaeopteryx. Whale evolution. Lobed fin fish is not a transitional form. Tiktaalik Roseae have zero evolutionary changes. Same as living lobe-finned fish. Common structures are from a common designer. Hopeful Monster Theory. Punctuated Equilibrium. Ape men. Piltdown Man. Nebraska Man. Ramapithecus. Lucy. Toumai man (Sahelanthropus). Gene Depletion + Natural Selection = Evolution is Impossible. Joshua setup twelve stones to remember what God had done. In the book of Judges they forgot God and did that what was right in their own eyes in one generation. The United States was founded by mostly Christians and on Christian principals. Voluntary public schools taught the ABCs using the Bible. Most universities were seminaries. During the 1800s the belief in millions of years was popularized. Charles Lyell Principles of Geology. Uniformity. Geologic column. Karl Marx wanted free education in public schools. G. Stanley Hall believed children were at varying levels of evolution. Sigmund Freud believed religious beliefs can be overcome with science. Pavlonian theories to train children. Training vs education. Our Constitution was made for a moral and religious people. It is wholly inadequate to government of any other. ACLU said communism is the goal. The sooner we get children away from their parents the better. There are no absolutes and no morals. $13,000 per student to educate in the public schools. Attending a public school and getting an education are not the same. Saul Alinsky's Rules for Radicals based on Neo-Marxist goals. Whatever we once were we are no longer a Christian nation. You don't want the village raising your children. A child will believe anything you tell them, and for 100 years we have been telling children the Earth is billions of years old. Radioisotope dating methods are based on assumptions which corrupt their integrity. Assumptions: Zero daughter material, zero contamination, stable decay rate, God had nothing to do with anything. Carbon-14 dating goes back at the most 80,000 years, not millions. Lava that formed in 1801 dated to 325 -3,000 million years old. Meteorites dated to 4.5 billion years. Meteorites are only found in the upper layers. Millions of years comes only from the geologic column that was invented in the 1800's, not from science. The lobe-fin fish was a index fossil fro 325 million year old rock, until they were found alive today. Wollemi Pine supposedly extinct for 150 million years. Geologic column does not exist. Fountains of the deep produced rain. Fountains brought down the water above the firmament. Earth's land mass split apart. Plants and animals were buried in sedimentary layers. Fossils form rapidly. Water wheel. Hat. Fossils buried rapidly. Polystrate fossils standing upright through many layers. All fossils and oil contain carbon-14. Branching coal seams explained by the flood. Caves form rapidly. Animals deposited together forming oil and natural gas. Hot waters caused the ice age. Mountains formed after the flood. Tallest mountains have fossils on top. Bent rock layers without fractures. Grand Canyon formed in days, not by the Colorado River. 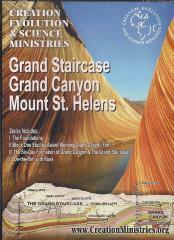 Grand Staircase shows miles of missing sediment. Sedimentary layers show God's judgment. Psalm 119: Thy word is true from the beginning. God's word is under attack. Are the 6 days of creation poetry or history? Hebrew is usually S-V-O when poetic, and V-S-O when factual. All of Genesis is historical fact. The Hebrew word “yom” refers to “day”. Moses should have used “olam” if refering to a period of time or an age. Ephesians 4: Don't be deceived by craftiness of man. “Yom” is a 24 hour day when 1. Is light followed by darkness. 2. Uses the words evening and morning. 3. Each yom is numbered. The “waw” consecutive connects the verses with “and” indicating the events happened in 6 consecutive days. Gap theory: Billions of years in between 1:1 and 1:2. Adding up years in genealogies comes to about 6,000 years. Progressive Creation: God used death to create the different animals. Old Earth compromise always puts death before sin. Exodus 20:11: In six days the Lord made the heaven and the earth. Jesus said “In the beginning God made them male and female” and “He that is not with me is against me.” Isaiah 11: In the new world animals will not kill each other. Man and vertebrates are referred to as “nephesh chayyah” (living souls or living creatures). Plants and invertebrates are not “nephesh chayyah.” Death is the enemy and will be eliminated. What was the Earth like before the worldwide flood? There may have been hyperbaric and greenhouse like conditions. Amber contains air bubbles with 50% more oxygen. Spring like temperatures all year. Antarctic dinosaurs. People lived to be over 900 years old. Some speculate of a water firmament. Global flood legends from around the world. How did Noah get the animals? How did the animals fit on the ark? Land dwelling, air breathing, animal kinds were sent to Noah, not every animal species. About 13,000 animals with the average size of a house cat. Bring juveniles. The word dinosaur invented in 1841, before that time they were called dragons and serpents. History books are full of dragons. Alexander the Great. Pliny the Elder. Apollonius of Tyana. Nerluc France. Pictograph of dinosaurs all over the world. Original biomaterial in dinosaur bones. Job chapter 40 behemoth dinosaur. Job 41 leviathan the fire breathing dragon. Bombardier beetle. Gigantic insects. 18” cockroach. Dragon fly with 3' wingspan. Most dinosaurs died in the flood, but were on Noah's ark. They are now probably all extinct. Arizona has many incredible natural formations, the most impressive of which is the Grand Canyon. 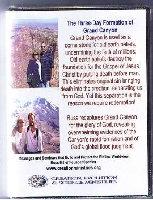 This film follows Russ Miller on his tour of the Grand Canyon. Formed by a massive water breach through the Kaibab Uplift. This happened very rapidly, not over millions of years. 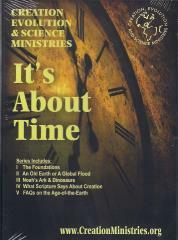 The government funded park gives out propaganda for the secular worldview that advertises millions and billions of years. Radiometric dating methods can determine the elements in the rock, but they cannot tell the age of a rock because of the assumptions involved. Multiple dating methods are used on a sample, and they pick the method that matches their belief in the made up geologic column. Bottom of the canyon shows creation rock, and above them is the flood sedimentary layers. The foundation of the gospel is in Genesis 1-3. If original sin did not happen, then we do not need a savior from sin. Do we believe man or God? We should believe the Bible word for word, and cover to cover. How do biblical accounts line up to the facts? How old is the Earth? How long did it take to form the Grand Canyon? Uniformitarianism teaches that the past has been the same as the present. If true then the canyon took millions of years to form. 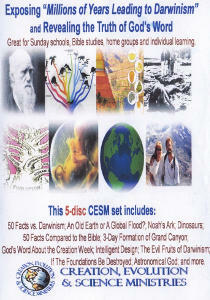 The evidence confirms God's word and the worldwide flood. Mt. St. Helens formed strata layers in minutes, not years. In Grand Canyon the layers contain fossils indicating rapid burial. Polystrate shrinkage cracks indicate layers above were deposited at the same time as layers below. No time in between layers indicated by flat strata (no erosion, roots, etc.). Creation rock is not stratified. Great Unconformity has supposedly 1.2 billion years of strata missing, but those layers were actually removed rapidly during the flood. Coconino Sandstone is not desert sand, but deposited underwater. Sponge and coral in the Redwall Limestone are not found in reefs, but in pieces because of the rapid deposit. Crinoid heads found indicating rapid burial. Billions of nautiloids found in Redwall layer all facing one direction from flowing water deposit. Polonium radio halos found indicating rapid rock formation. Cedar Butte stands 900 feet atop the rim of Grand Canyon indicating tens of thousands of square miles of missing sediment. When you are standing at the rim there used to be a mile of sediment above your head that has been removed. Late flood erosion probably deposited the Grand Staircase. Vermillion Cliffs, Zion Cliffs, Bryce Canyon which is not a canyon but a sapping structure. Lack of rock debris indicates rapid formation. If rivers carve canyons then why are there not millions of canyons around the world? Large canyon formed at Mt. St. Helens in hours. Grand Coulee in WA was formed by a glacial dam breach in days. You can not bend rock, yet we find geologic compression events indicating the sedimentary layers were not yet solid when bent. Could not have been due to heat or pressure because then they would be metamorphic rock. Kiabab Upwarp shows folded, unbroken, rock layers. Late flood waters could have been channeled and flowed through Kiabab Upwarp forming the Grand Canyon. Or the canyon could be a large dam breach of lakes that held 3 times the amount of water as Lake Michigan. Crumbling rock walls form rapidly, so the lack of rocks and steep walls indicate young canyon walls. Indians have a legend of a flood forming the canyon. No millions of years means no evolution. Operational Science is knowledge derived from observing and testing. The Bible is scientifically accurate. No contradictions in the Bible. 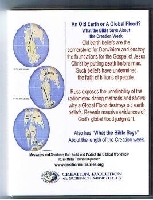 Bible teaches the earth is round, not flat. Triune God created a triune universe. Father, Son, Holy Spirit. Space, matter, time. Height, width, depth. Solid, liquid, gas. Past, present, future. Theory of General Relativity claims the universe had a beginning. The cause must be outside the universe. Life cannot come from non-life. Design cannot come from chance. Symbiotic relationships of plants and animals. Giraffe design. Your brain computes data from trillions of nerves. Ear design fully formed at birth. Eyes have over 1 million nerve connections. The had to have evolved independently happen 5 times. Bible describes the hydrological cycle. Bible describes the light causes wind. 83 verses in the Bible that talk about germs over 3000 years before germs were discovered. Bread strengthens your heart. Population growth curve fits having 8 people about 4,400 years ago. If people were here for 100,000 years then there would be 150 people per square inch. Trees can make more than one ring per year, and they find trees that are 4,300 years old. Great Barrier Reef is 4,200 years old. Oceans have too few minerals like salt if they were millions of years old. Second Law of Thermodynamics fits what we observe from creation, not evolution. Earth's magnetic field dissipating. Mutations cause the gene pool to get weaker over time. Animals and plants reproduce after their kind and will never produce something with new genetic information. Natural Selection prevents evolution. Gene Depletion + Natural Selection = Zero Macro-evolution. Only one human race with different skin tones. Blood transfusions do not care about race. Studies show we were all descended from one man called Y-Chromosome Adam. We can be traced back to one woman called Mitochondrial Eve. Estimated 80 trillion cells in your body. 1 trillion seconds is 32.000 years. You are very complex. Each cell contains 3 billion base pairs of DNA. Earth is the right size. The sun is the right star. The distance is perfect for water and life. Year, month, day all from the cosmos, but the week is from the Bible. God made the stars also. A light year covers 6 trillion miles (not an amount of time). Betelgeuse would be 2x the diameter of the earth's orbit. Antares is 700x the diameter of the sun. Mu Cephei is the size of Jupiter's orbit. VY Canis Majoris is huge-mongous. Hubble telescope trying to catch the first light from the Big Bang, but instead found over 600 fully mature galaxies. God compared the number of stars to the sand on the beaches, at a time where they thought there was only a few thousand stars. Hubble telescope 96 hour exposure found over 3,000 galaxies. God knows the stars by name. He cares for each of us. Star of Bethlehem. Christmas star. Jesus tells us to beware of sheep, because wolves are dressed as sheep. 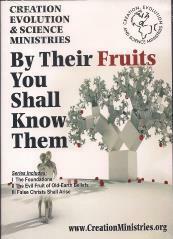 You will know them by their fruit. Old earth beliefs popularized by Charles Lyell. Uniformitarianism. Moses lays the foundation for the gospel. The perfect creation is corrupted bring death. Worldwide flood forming layers full of fossils. Old earth beliefs undermine God's word. Professing themselves to be wise, but they have been fooled. Darwin's theory attempts to get rid of God. Darwinism gave racism a foundation. Eugenics has caused the death of billions of humans. The German Fuhrer sought to make the practice of Germany conform to the theory of evolution. Social Darwinism reached it's peak in Nazi Germany. Communism and Socialism founded in atheistic Darwinism. Communism fails because they overlook the truth of man's sinful nature. Millions of years lead to Naturalism and Secular Humanism. Kids taught it is a fact that man has evolved. The magic ingredient is time. In 1963 prayer and creation removed from schools and the drug and immorality culture took over. Register weapons to confiscate later. Neo-Marxist goal is to erode Biblical absolutes and Christian morals. The original community organizer wanted his book dedicated to Lucifer. Community Organizer disorganizes and causes strife in the community to reorganize. Animal rights movement said Christianity is our foe. Christians think man are more important than animals, therefore they should be eliminated. Margaret Sanger wanted to eliminate the “human weeds” and “inferior races”. On 9/11 over 3,000 people were murdered by terrorists, but over 4,000 babies were murdered that same day. Top problems in public school are now drug abuse, alcohol abuse, gangs, pregnancy, abortion, mass murder. Suicide rates and violent crime rates. School shootings. Columbine shooting shooter “Disgusted by the inferior breed of humanity around him” and wore a shirt that said “Natural Selection”. Churches marketed to young immature people and are not teaching the Word of God. Biometric identification. Trust God. Pray. Preach. Jesus said to take heed that no man deceive you. What is the source of truth? Thy word is truth. Believing in the true Jesus is essential. Thoroughly abide in. Conviction comes from the Holy Spirit. The Biblical Jesus Christ is our creator, savior, died on the cross, rose again, sits on the throne. What must we do to be saved? We trust in the living God. Not everyone that says “Lord Lord” will enter heaven. How do we avoid being deceived? Search the scriptures. Be like the Bereans. Don't give heed to fables. False prophets will be dressed as sheep, promote false teachings, change the Creator or the Judge described in God's Word, mesh secular teachings into God's word, mislead people. Submission to Christ without submission to the Scripture is submitting to a false Christ. Multi-billion dollar church industry marketed at seekers, and have abandoned soul-winning and biblical knowledge. Success is measured in head-counts and financial income. Worship is ME centered. Music reflects how WE feel. Messages teach how WE can feel good. Creation, sin, personal responsibility, and Jesus' shed blood are left out. Lukewarm and lovin' it. Teaching God's uncompromised Word strengthens people's hope, faith, and belief in the true Jesus Christ. Eye-opening for anyone who has attended school in the USA since 1963 or who thinks Darwinism is true. 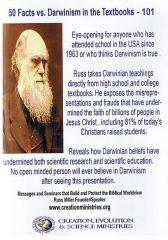 Russ takes Darwinian teachings directly from high school and college textbooks. He exposes the misrepresentations and frauds that have undermined the faith of billions of people in Jesus Christ, including 81% of today's Christian raised students. 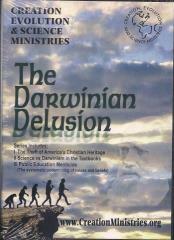 Reveals how Darwinian beliefs have undermined both scientific research and scientific education. No open minded person will ever believe in Darwinism after seeing this presentation. Old earth beliefs are the cornerstone for most of the world's false religions, including Darwinism. Old earth beliefs destroy the foundations for the Gospel of Jesus Christ by claiming death existed before man's original sin. Russ explains the vital issues in his easy-to-follow style. He exposes the errors of the radiometric dating methods and employs a Global Flood theory to reveal massive scientifically observable evidences of the worldwide flood. Grand Canyon is a cornerstone for fooling people into accepting old-earth beliefs. However, it wasn't a little bit of water and a whole lot of time that formed Grand Canyon. It was formed by a whole lot of water in just a little bit of time! The evidences of the rapid formation of the "Big Ditch" are overwhelming. Learn the facts in this eye-opening presentation by Russ, who guides our awesome "Get on the Bus with Russ" creation-based Grand Canyon tours. The Pre-Flood World was very different than the world in which we live today. Learn how man could live to be 900+ years old and why "Pre-Historic" (Pre-Flood) animals grew so large! This and much, much more while Russ recaptures Dinosaurs and Noah's Ark for the glory of God. Russ reveals overwhelming evidence that we can put our trust in God's Word, Word for Word and cover to cover. Using Scripture to explain Scripture, we find the absolute Truth of God's Word. What does God say about the length of time of Creation? Intelligent Design is an up-and-coming scientific field and Christians need to realize that, while every Christian believes in an Intelligent Designer, not everyone who believes in Intelligent Design is a Christian. 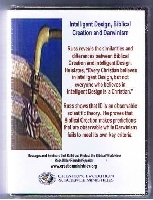 Russ compares ID, Biblical Creation and Darwinism together so believers will understand the plusses and the minuses of the ID movement. Jesus said we are to tell good from bad by the fruit. From Communism to Nazism, from eugenics to abortion, learn how the teaching of "millions of years leading to Darwinism" has undermined the faith of billions of people, as well as the USA, and led to the premature death of billions of people. 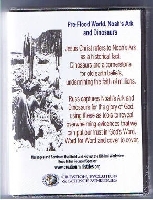 In this DVD Russ reveals the foundational importance of Biblical creation to both the Gospel of Jesus Christ and to the freedoms enjoyed by citizens of the USA. He also proves that the USA was founded by predominantly Christian men on predominantly Christian principles. 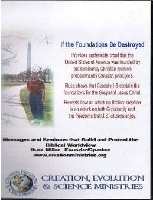 Viewers will clearly see that an attack on Biblical creation is an attack on both Christianity and on the USA. Learn the importance of Biblical Creation and the history of America in this powerful presentation.